PUMA is elevating its sports-inspired streetwear game to the next level with the latest innovative footwear silhouettes debuting throughout 2017 under their Run The Streets campaign. PUMA has taken design cues from their performance heritage, refreshing them with contemporary styles and amping them up with new technologies. Driven by design and functionality, the new Sportstyle platform features a number of running-inspired products with a street-ready look for those whose hustle never stops. At the forefront is the all-new TSUGI silhouette. PUMA took to the sensibilities and functionalities of Japanese design to perfect this iteration. ‘TSUGI’ that translates to ‘NEXT’ in Japanese, incarnates the fusion of modernity, technology and traditions, bringing a new wave of aesthetic to progressive streetwear. 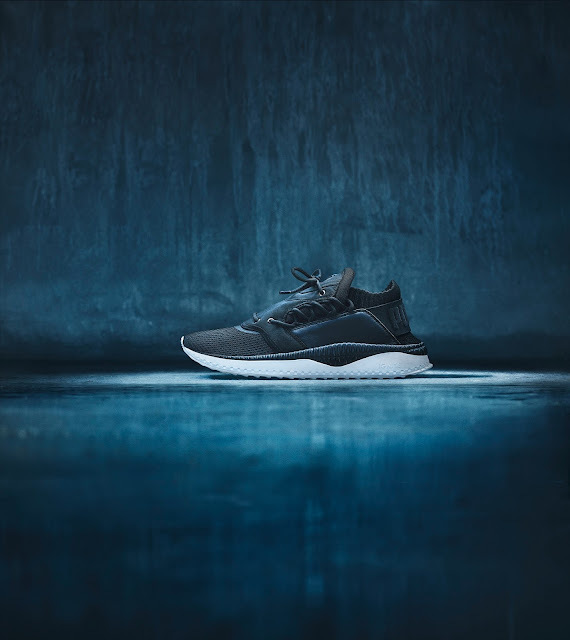 With TSUGI, PUMA brings to the table their successful track record Sportstyle Running footwear design and long-standing commitment of pushing the boundaries of innovation. This was the foundation for the creation of TSUGI and it defines the future direction of the Brand. PUMA injected their most innovative running cushioning technology, the IGNITE FOAM, into the new TSUGI range. Strategically placed under the foot-bed, IGNITE offers ideal flexibility in the forefoot and cushioning in the heel for comfort. What gave runners the optimal rebound and comfort can now be enjoyed by sneakerheads on the streets looking for the latest high tech streetwear solution. First to drop from the range is the TSUGI SHINSEI. ‘SHINSEI’ which in Japanese means ‘REBORN’, takes on this progressive philosophy a step further. Always forging the way in offering alternative closure systems to the market, the TSUGI SHINSEI features a unique lacing concept for a progressive look and extra comfortable fit. By pulling the lacing along the lateral and medial side of the foot, the wearer is assured of the right amount of fit. The TSUGI SHINSEI also features a sock construction, nylon padded tongue and textile vamp for an ultra-snug fit. More than its functionality, it boasts a minimal, contemporary style that’s beautiful and unique to the market. The TSUGI SHINSEI Black and White colourways will drop on Friday, 21 April 2017, for R2 299 at PUMA SELECT Bree Street, Cape Town and Braamfontein Johannesburg, PUMA stores and Anatomy.